ESSENDON forward Orazio Fantasia has suffered a finger injury in a training accident which will affect his pre-season for several weeks. 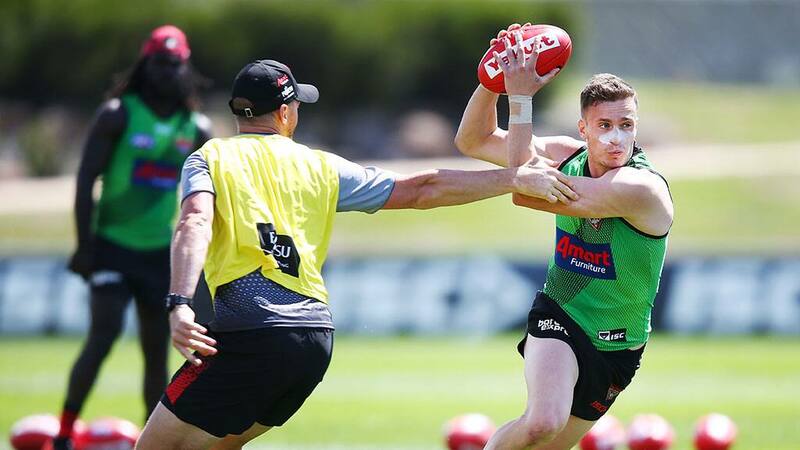 The exciting small goalkicker had the setback in a training drill, which comes on the back of a frustrating season for the emerging Bomber who was restricted to 13 games and 20 goals in 2018. Bombers performance manager Justin Crow said the injury should not be a major issue for the 23-year-old after he got his little finger stuck in a jumper. "We obviously had some concern about that, so we got it scanned. His tendon is intact, which is very good news," Crow told the club website. "The slip around that tendon, which acts as a pulley, has been affected so you'll see Orazio in a splint over the next couple of weeks. "Then we'll reassess the finger and see if he needs to continue in a splint beyond that. "The good news, though, is that Orazio can keep running, kicking the ball and doing bits and pieces with the group that don’t involve tackling or that finger over the next couple of weeks." The news isn't overly positive for key forward Joe Daniher either, with the 2017 best and fairest winner and All Australia unlikely to rejoin full training until after the club's Christmas break. Daniher managed just seven games and eight goals last season before succumbing to osteitis pubis that ruled him out for the rest of the year, but he has been on a managed program since then. "We're building him up really gradually," Crow said. "The idea is that he gets a big foundation of running and work that we know will set his groins and his body up to have a good season. "We'll be training him accordingly and taking our time to make sure we get him right for the season." Marty Gleeson is also yet to resume full training after his ankle surgery in the pre-season competition this year, while captain Dyson Heppell and best and fairest Devon Smith are also yet to start full training after "taxing" seasons.